Will stem cells work in relieving the pain from an arthritic joint; that is the question? A patient read my blog and called to discuss his experience with the orthopedic surgical community. Since his is not the first time I came across opposition to Regenerative Medicine, I thought I would focus on that resistance this week. An orthopedic surgeon is just that, a surgeon. Usually trained with a major emphasis on surgical technique and evidenced based medicine, it is difficult to foster change within the orthopedic community. I should know as I practiced orthopedic surgery for 38 years developing that surgical technique in the joint replacement sub specialty and doing the clinical research that led to the evidence forming the basis of modern hip and knee replacement surgery. During that era, I also noted the failures of joint replacement and other adverse outcomes so I started seeking an alternative to joint replacement, basically a biological arthroplasty.You better believe the orthopedic community has not rapidly adopted this latter concept in theory. Yet, orthopedic surgeons have been attempting cartilage restoration for over seven years and actually informing the surgical candidate about stem cell treatment of arthritis every time they performed an arthroscopic micro fracture. The Arthroscopic Package for the injured or arthritic joint includes micro fracture. The explanation behind the technique of micro fracture is that one is allowing a patent’s own adult mesenchymal stem cells to migrate from within the bone marrow to the joint by creating multiple small holes in the diseased cartilage communicating with the marrow. The only problem with the hypothesis, no matter how enticing, is that by time a patient reaches the age of 40 to 50, there is no active marrow remaining near the knee and very little remaining at the hip or the shoulder. Why not then, harvest bone marrow from the pelvis where it is plentiful at any age, filter out the stem cells and concentrate them followed by reinjection after the micro fracture? It makes all the sense in the world, is worthy of clinical trial and outcomes surveillance, and does not make the Arthroscopic Package much more complex. 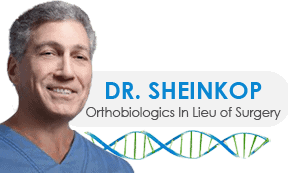 In my attempt to overcome the negative reaction of the orthopedic clinical community to my Regenerative Medicine initiative increasingly made known to my patients, I sought the guidance of the leader of a think tank and a mentor, Chef. In August, I have been invited to speak before an orthopedic audience for the first time to share my earliest observations regarding response to stem cell management of arthritis. Two weeks ago, I did my first case; last Wednesday, I did three. It won’t be a series on which to report but I certainly will have something new to share. The Reality show to be continued.